Enough food is produced in the world today to feed everyone, but it's not the case... That's the best way to see the total failure of our actual human societies. This is what I tried to represent in this picture. What can we do? We can help associations like the World Food Programme: http://www.wfp.org/help . License: CC-BY-NC-ND David Revoy, www.davidrevoy.com, 3 september 2010 . Very powerful picture david. I think it say's a lot more than most of your fantasy pieces. I wouldn't call it a total failure, maybe a partial failure. But you are right, there is something wrong with us still. Wow, great idea to play on the yin and yang thing, simple and direct yet draws you into the details, well painted. this is a powerful depiction. Celui-là fait partie de mes préférés, il est dérangeant et beau à la fois. Plein de finesse et de rondeur. Un petit chef-d'oeuvre ! A very well depicted international crisis... So sad. nice.............however doesn't yin and yang represent some sorta balance.....like complete opposites that are complementary ? 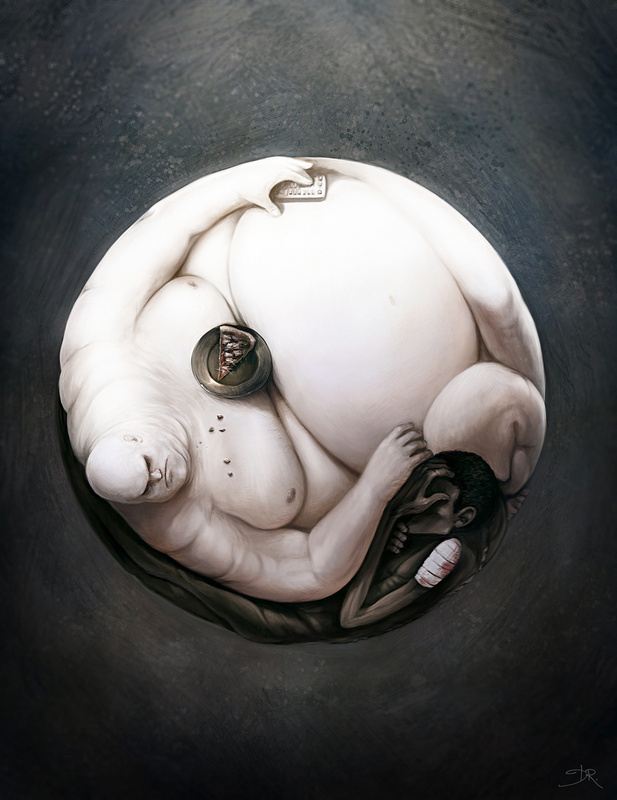 Ha ha ha très impressionnant ta vision du ying et yang. Tout d'abord, félicitations bien sûr. Comment obtenir l'interface de Gimp telle qu'elle apparait dans ce tutoriel? Thanks for all the feedback about this unusual piece in my portfolio ; this artwork is highly shared into social website and blogs. I saw a blog with 10 000 sharing links about it. Note a tutorial exist about it on this month CGarena pdf mag issue. @Brownie : http://davidrevoy.com/?article29/ in my brush kit there is also the file to change the Gimp Ui position like in the tutorial. Hello Deevad, never realized you work with MyPaint and GIMP though I've seen your works in other places, including CG society. This piece in particular is extremely powerful. Really though, all your stuff's amazing, thanks for sharing with us. I was only recently told about MyPaint and experimented with it briefly before having to upgrade to windows 7 on my main workstation which wiped out linux. I'm still setting it up and going to do a backup before re-installing linux for a dual boot. I really didn't know my way around MyPaint though the brush engine impressed me very much. I need to figure out a way to configure my wacom better in linux. The GIMP-paint I've not tried, the only thing I heard was that it isn't supported anymore which is a big turnoff to me to the point that I don't even want to try it. I'm assuming it's some skinned version of GIMP with stuff laid out slightly differently. Maybe you know better as a user. Wow that looks great. I'd really like to flattr it but sadly it doesn't have a button. i am a student in college, and my professor recently asked us to choose a visual rhetorical image to help us (students) give a speech on world hunger. i am also an art major and really love all of your work, though i am not nearly as talented in photoshop and GIMP. I am quite talented with acrylics, and my art studies are helping me to become much better. I found this piece to be very compelling (aesthetically as well as the message you convey) and would love to use it in my world hunger speech. Is there in additional information I could obtain form you on this piece? Like, how exactly you came about this particular subject matter? Was there a particular situation in the world that compelled you? Please, if you could help me, that would be absolutely fantastic! I will post it asap on this blog too. thank you very much! i greatly appreciate it. i added you on facebook too if you think of anything i should know. Incredible picture. Thank you for being one artist that does more than just art, but gives a deeper sense to it. Thanks a lot Johannes, merci. Hello. I stumbled upon this painting on a friend's blog. I instantly fell in love with it. The idea is so simple yet portrays such a strong message. Because of this, I am getting this as a tattoo on my rib cage this saturday. I really enjoy this work of art. @Luke Peterson : Thanks for your comment, and good luck for the tatoo ! Although this is a very nice piece of work, I feel that you miss use the yin and yang ideals. Research Tao and you will see that your art doesn't flow with it. For instance the main idea is that yin cannot live without yang. Everything is made of yin and yang. Some have more yin and some have more yang. That is why this look different. This suggests too much yang is bad but according to Toaism that is just how things are made. Nice work though. @Tao : I found fun to read your feedback and point of view. Just wanted to precise here : I'm not taoïsm nor expect to be one, and sorry if you feel my artwork did misusage of a symbol you love and certainly understand on a spiritual level. Here I use it for another topic. More graphic. This is dead on. Seriously, great job on this! I couldn't picture a more perfect way to describe the world hunger today, and this is amazing and it's great! I seriously had a loss of words when I saw this! Wow.. Really good, and so real ! This is just racism. Why is that fat dude white? Do you know how many black fat asses there is in USA? @vtero : Not sure if trolling, or just st****d .
I would please like to use this as a front cover for a book I intend to publish soon. I am a Bantu man from "South Africa" and my book is about certain unsavoury trends in the thinking of my fellow Bantu. This image help to capture the sad posture taken by so many people here in Africa. They have become accustomed to victimhood. My book will seek to address this penchant for victimhood. I would explicitly credit you as the original artist on the back cover. @Sizwe : Hi Sizwe, Thanks for being interrested into my artwork. Offering credit for the book cover is nothing spectacular as it is a requirement in publishing , and I doubt I will be ever famous because of a creditation... Even , let say, for a CocaCola project... In fact : noone care about the little credit name at the back of the book... It's a fact. As you want to make a commercial usage about it, I would authorize it only if you pay for a right of usage. Thanks to mail-me on info@davidrevoy.com for more info about my rates. Very clever piece of work, I'm really speechless. really wonderful ... if you had a few more options would be adding some good colors . Amazing piece, I'm blown away by how creative and impactful this is. Inspiring! When rich fat people are trying to find 'magic pill' to became slim, poor and slim people are trying to find at least some food. It reminded me my last work, where I was an CNC operator/programmer. Me, 26 locksmiths, my 3 colleagues, 15 turners, 56 millers were crying person with bandage on shoulder on your artwork. And our CEO was that fat guy with pizza and remote control in hand. Anyway, if this artwork was about us, there vould be no 'yin-and-yang' efect: our crowd of workers in blue and camouflage clothes and CEO in his 'wedding costume' couldn't give such contrast. Sorry for my poor English; hope that main idea was at least a little clear. Would it be alright if I use this image as an example in a graphic design class. I wouldn't edit it and I would be able to provide a link to your blog. Hey! Love this Picture. Is there a possibility to get it in High Resolution?